We hope you all had a great holiday time and a happy new year! After the holidays it’s back to work – and we’re happy to announce that our last missing core mechanic, the mercenary contracts, has now made it into the game. From now on it is adding meat to the bones, that is content, polishing and eventually secondary features. 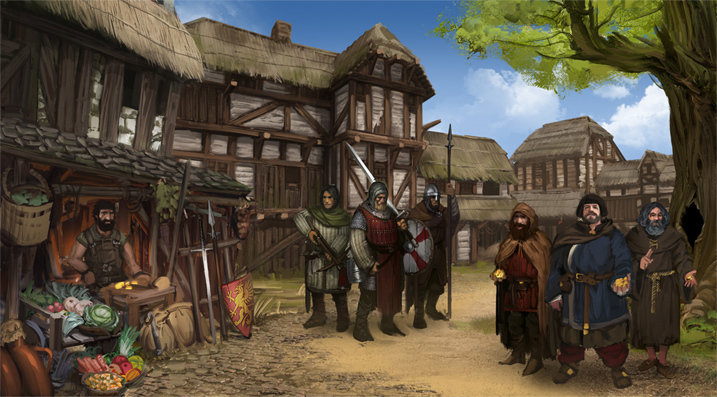 Read up in our progress update on villages, castles and mercenary contracts to learn more. As your mercenary company roams the land there are a number of friendly locations you can interact with. Both civilian locations, such as villages and larger cities, and military locations, such as watchtowers and mighty strongholds, can be entered. As you enter them, you’re presented with a screen that acts as both an atmospheric backdrop, giving you a sense of where you are, and a hub for all actions there. From here, you can reach the shop to stock up on equipment or sell surplus items, you can hire new men to fill your ranks, and you can bargain with potential employers over mercenary contracts and collect your pay for done deeds. Of course, depending on where you are, you’ll have more or less options. For example, the selection of goods is far greater in a rich city than in a poor village – but so are the prices. Castles will offer different equipment, more suited to professional war, than villages which often have to use improvised weaponry and armor – not any village smith will be able to forge you a masterwork armor, afterall. On the other hand, you’ll find potential recruits more readily at villages and cities than at a lonely watchtower along the road. This is how the new village screen looks. 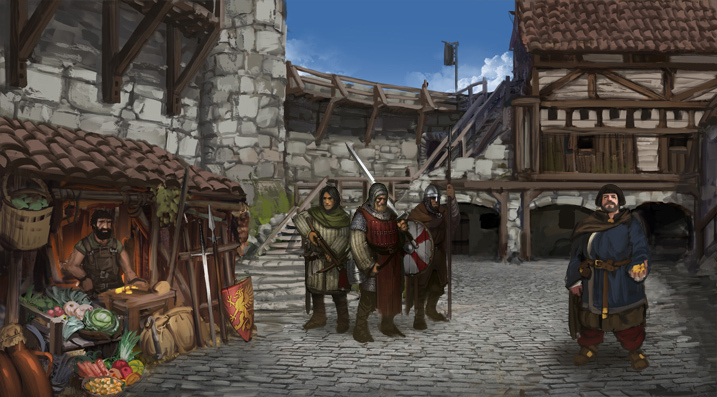 You can see the merchant on the left, mercenaries for hire in the middle and potential employers on the right, each with a contract offer of their own. The people are placed on a different layer and only shown as there is a reason for them to be there; the mercenaries are only shown as there are actual people to recruit, and the number of potential employers shown depends on the actual number of contract offers available at that location. As you can see, castles use the same general layout, but have a different backdrop for atmosphere. In addition, we aim to have different soundscapes for individual locations to convey the vibe of a living and breathing village, or a busy castle readying itself for war, respectively. 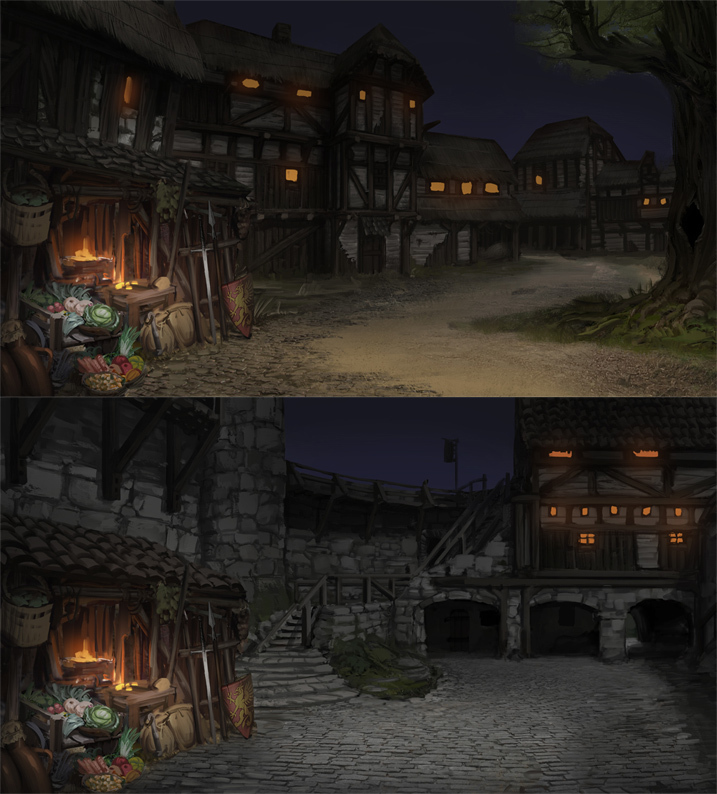 During night time, both villages and castles will close their shops until morning. Ultimately, we want to have more and different backdrops for a number of locations, so that villages and cities feel noticeably different not just by the options available there but also in atmosphere. For the time being, however, villages and cities share a backdrop, while castles and watchtowers share the other. A core mechanic of a game simulating a pseudo-medieval mercenary company is the idea of mercenary contracts. Basically, your men being hired to fight for coin. We’ve talked quite a bit about how contracts are issued and how they work in the past, and even if your’re familiar with the details, you might want a refresher at our previous blog article here: Blog Post on Contracts. With the basics out of the way, we can announce that mercenary contracts have finally made it into the game. We’ve started with a few simple ones to ease us in, such as the classic errant (someones hires you to safely bring an item to another location) and the less classic discovery of a location (someone hires you to venture out into the wild to find a particular location, with varying degrees of clues to point you into the right direction). Now, let’s take a look at how the whole contract process works by using the example of another contract type, the hunting down of wild beasts. As a party of werewolves roams across the worldmap and dwells in the vicinity of a village for a time, snatching a villager as meal every so often, that village will get alarmed and try to get rid of the looming danger in the area. It can muster a militia force if it has the resources to do so, but militia fights poorly and is ill-suited to tracking a pack of dangerous werewolves in the forest. A better course of action is thus for the village to offer a mercenary contract to exterminating these beasts, that is, offering payment for the player to track down and destroy the party of werewolves which has a very real effect on the village by slowly draining its resources. 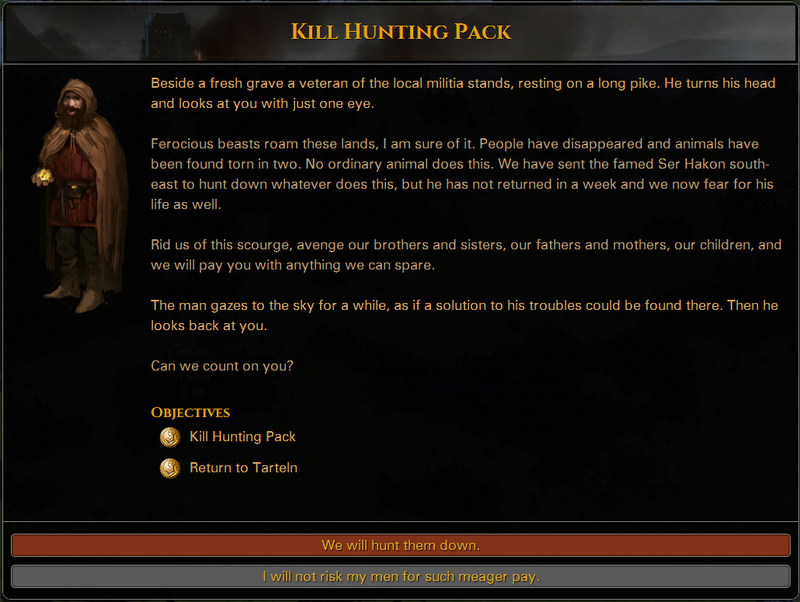 As the player enters the city, an individual will offer the contract to the player in the form of a short story, looking something like in the image above. The details of all contract offers are proceduraly generated, making use of a variety of interchangeable pieces. Two contracts to hunt down beasts can therefore have very different descriptions – different employers, motivations, payment and potentially helpful details, such as where the beasts were last seen heading. A poor village may not be able to pay you much in terms of coin, but may instead offer to pay with bread and dried meat – is it still worth it for you to risk the lives of your men? Although, realistically speaking, we can’t really avoid repetition here, our aim is to provide enough variety to have these texts be interesting, informative and succinct enough to be read well into a campaign and provide atmosphere, context and light roleplaying opportunities. We purposefully decided not to go with a bare billboard list of tasks with nothing but rewards attached but want the player to pause if only for a brief moment and consider what his or her actions mean in the context of the world. Upon confronting the beast party and killing the werewolves the player has to return to the village to collect the promised pay. Here again we use the same screen with a short procedurally generated story to give closure to the contract, pay out the player and provide a bit of atmosphere. At this time we have four different contract types in the game, all relatively straight-forward. We aim to have several more for the initial Early Access release, including escorting caravans and defending a location from raiders. After the initial Early Access release, we aim to experiment with more complex contracts, including contract chains where one fulfilled contract can sometimes lead to another. We feel that a large number of varied contracts, both simple and complex ones, will go a long way to keeping things entertaining and diversified. Sooo….. whens early access? I want to give you money already! How about the possibility to reject reward? Safety of the village beeing the only reward you need. Interesting idea. Didn’t think of it, which probably tells something of my character. We’ll discuss it. Edit: Added it for this contract type (and probably a few others in the future). Declining the reward now has an actual effect, as taking the reward lowers the resources of the village a bit. 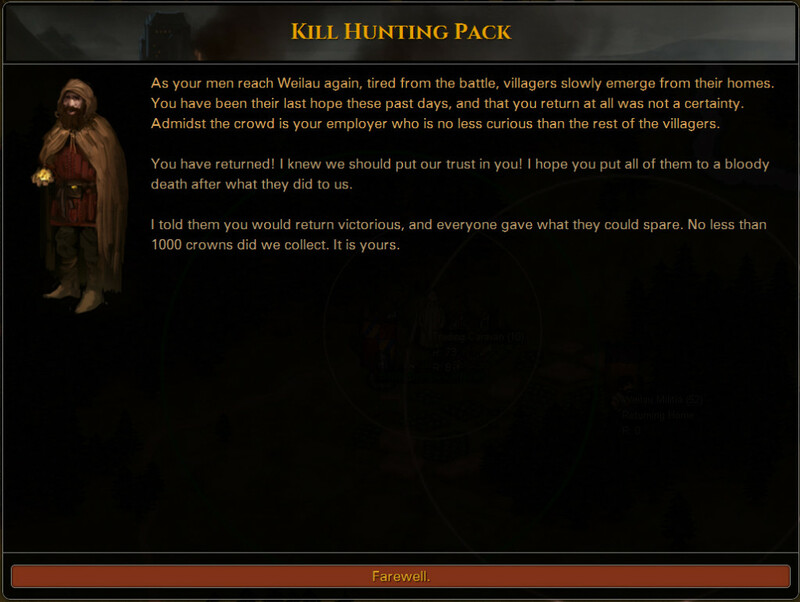 That’s awesome; I was just thinking something similar when reading the quest dialogue and reminiscing about helping villagers survive bandit attacks in Mount and Blade and turning down offers for supplies (and getting good reputation and honor instead). I’m glad to see this game is shaping up, I can hardly wait until release. Thinking about caravan quest I wondered: would there be battles with more than two teams? I mean some friendly allies which are not controlled by player, but fights on his side. Or may be some neutral forces that attack both player and his enemy (wild animals for example). Yes, battles with multiple factions present are possible. For example, there could be a battle between orcs, undead and the player. These factions are not allied. We still lack the tactical combat units for other human factions right now but they are on their way.